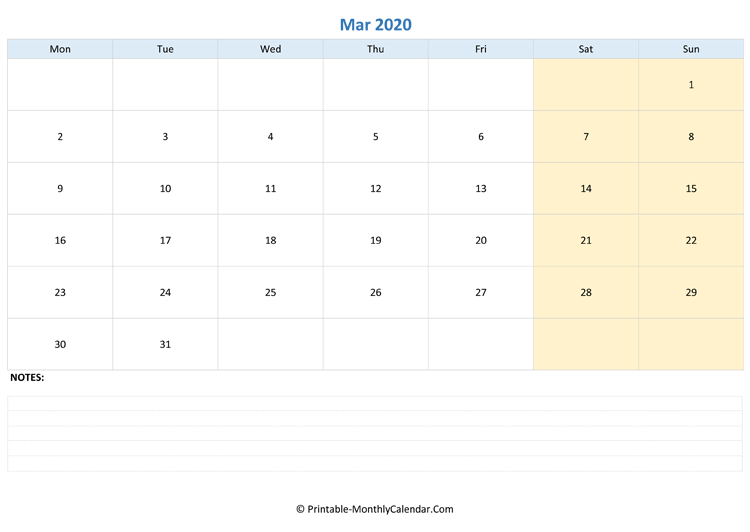 Download March 2020 Editable Calendar with Notes (Landscape Layout). 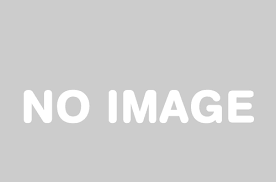 This march calendar 2020 has weeks starting on Monday with weekend highlight and a space for notes below the main calendar. A portrait layout for march templates also available for download. We have some other march 2020 in landscape layout here. Pick one style you want then print a calendar for march. 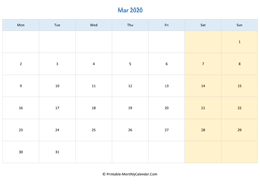 As well as March 2020 Editable Calendar with Notes (Landscape Layout), you can also download full year calendar with both of 12 months in one page for current year and other years. Those calendar come with us holidays and notes space below the main calendar.